A thief dubbed the "pickpocket queen of Birmingham" by police has been jailed after preying on elderly shoppers. Margaret Johnson has 153 offences to her name, including 93 for theft, West Midlands Police said. Her victims included a string of elderly women, as well as a heavily pregnant woman. Johnson, 40, of no fixed address, was jailed for 30 months at Birmingham Crown Court on 10 March after admitting six thefts. Among Johnson's victims was a 76-year-old woman shopping in Lidl's Tile Cross store on 2 February with her grandson who has Down's Syndrome, police said. She was caught on security cameras stalking the pair around the aisles and, when the pensioner had her back turned, she stepped in to take the handbag from inside a shopping trolley. Johnson also stole a handbag at the same store just six days after being released from prison in January, police said. 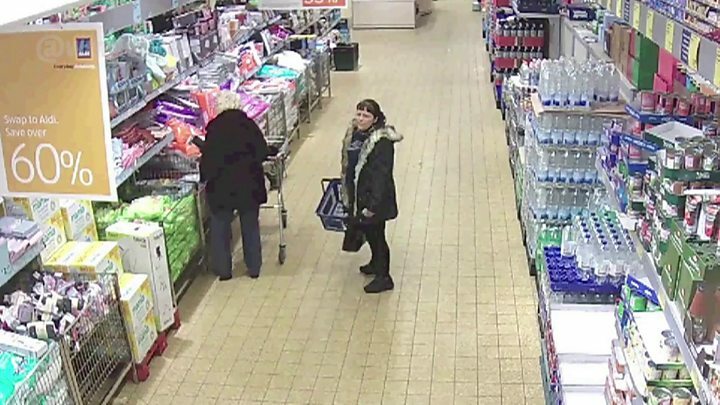 On 25 January she struck at Aldi, in Chester Road, Castle Bromwich, where she stole a handbag from an 84-year-old woman. The next day she stole a phone from a pregnant shopper at Home Bargains at Stechford Retail Park. Sgt Julia Slater, of West Midland Police, said: "She deliberately targets elderly, lone female shoppers - people she considers easy targets. "Even by her own despicable standards she has stooped to new lows with these offences," she added. Police said Johnson also admitted breaching a criminal behaviour order. She was also sentenced to a criminal behaviour order banning her from large parts of Birmingham city centre and from stores including Poundland, Iceland and Asda across the West Midlands.